Perfect for ingredient storage and a wide range of other food prep tasks, this half size 6" deep clear polycarbonate food pan offers a valuable addition to your kitchen. Designed to last even in the toughest commercial kitchens, this food pan is made with shatter-resistant polycarbonate material that resists scratches, dents, and clouding up for long-lasting use. It also naturally resists food acids and oils to maintain crystal clarity, making it easy to clean and maintain. Plus, its clear design enables you to easily see its contents, allowing you to easily store and identify your foods during prep. Whether using it to hold fresh fruits or vegetables, bulk sides, or meats, you can rest assured that it will withstand the abuse of daily use. These 1/2 size clear plastic food pan containers are so great to have for food storage and for prepping your foods with. Very easy to clean and also durable material. For the price you just can't beat this pan. Especially with as many as we go through and the Plus makes it even more affordable. These are really nice storage food boxes, I like how they are clear so you can see whats inside. They are made strong so they don't break easy if you drop them a few times. These are very easy to clean also. Great Product! just what I was looking for and a great price. We needed these for my sub shop and they are perfect for the prep table! Thanks You! I've been using this for sous vide- if you double up you've essentially got an insulated sous vide chamber for saving energy. They look nice, and I haven't chipped them in a year of use. Great clear food pan for kitchen use in a restaurant. It holds sides well and keeps them cold and fresh in the walk in or cold table throughout the day. Cheap and good quality. Its perfect for storing items in limited space such as reach in cooler or freezer. Dont forget get the lids so i will cover perfectly! This has been incredibly useful for multiple purposes. It is nice for storing medium quantities or larger items. I use it for everything from batches or pasta salad to prepped rolls for the day, to packing up all of my cake decorating and touch up supplies when heading out on a delivery . The plastic scratches a bit after a while, but over all a very durable and useful option for food storage. These are perfect food pans for your make line. The 6" depth really helps with keeping everything stocked. They also come individually wrapped which is nice. The 1/2 size clear Food Pan fits perfect in my prep stations, and the pan being 6" deep I am not always refilling. This saves me time when we get very busy. I love this 1/2 size clear food pan! I use these to store my desserts and it's nice to see what's left in the container. This is a nice clear container that can be used for food storage. I use it for keeping things organized under a counter and can see what's in it. Great pan for storage, wish the lip was different for drying after washing, they hold water. Get the sealable lids, they saves a lot of spills. We bought these containers and we love them , heavy duty plastic and easy to clean , the price is good , we highly recommend this product . We use these polycarbonate half pans exclusively for our lettuce. The plastic rather than metal surface keeps the lettuce from prematurely oxidizing. We will definitely be purchasing more in the future! Great prep area food pan. Very good quality product. Durable and dishwasher safe so clean up is very easy. A very good price compared to other vendors. This is a good food pan for a really good price. Much cheaper here than at our local restaurant supply store even with shipping. I bought 3 but had to replace one after only a month of use. As it had a tiny crack at the injection point in the bottom center. We just use it for lettuce but it would drip if there was any moisture inside. Still a great deal though. A very good, heavy duty and durable poly pan that holds up very well. Resistant to staining, you can't find a better pan for food storage, or holding than this pan. And at a great price. Not a bad product. Serves its purpose. When I ordered these i was hoping the lids I already had were going to fit but did not so I to spend additional money for other lids. It would be nice if they were universal. A deep six inch pan, that is half size so it can still hold a large amount of product, without taking up the space of a wider pan. Its strong and durable as well as affordable. These are great for using int he salad bar or pizza topping area. You can also purchase a matching lid too keep everything else out you don't want too get into the bins. Love this product especially at this price point. A deal that allows you to purchase several for the price of one at some of those chain stores. Not good at all. No brand so if you need to replace you are forced to buy from this store only, worse no good tied lids. Not able to buy rubber lids. Better go with name brands that offer good lids and you can buy replacements any where!!! Thank you for the review! We're sorry you did not like these. For lids that we guarantee will fit, Check out the You May Also Need section on this product page. Great quality half pans. We've been using them a few months now and they still haven't clouded or cracked. They are lightweight and stack easily. We purchased these to use in our salad station. They have worked really well and holding food and keeping it fresh. easy to clean and care for. Love these. I have bought a bunch and they don't warp, chip, crack, etc. great value. Ni will certainly be buying more of them ! This polycarbonate food pan is very durable and very well constructed. Because it is clear, it is perfect for storing vegetables or fruits so you can see how much inventory that you have. Nice product. Is exactly what I needed. Cleans and stores easily. Very durable plastic. I will definitely be ordering more of these as soon as possible! the perfect size bowl to store chopped onions, pickles or relishes on your concession stand. easy to see though it makes it easy to know when to replace. The 1/2 size 6" deep Clear Polycarbonate food Pan is a great item in the kitchen. One can clearly see the contents within, and it a very durable. The material is resistant to stains and clouding from oils and food acids which keeps this item clean and clear. It's durability extends itself to wide range of temperatures for use at -40 to 212 degrees Fahrenheit. The clear polycarbonate covers (purchased separately) are a must as well. 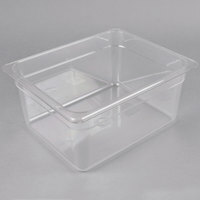 We use the 1/2 size polycarbonate food pan for storing prepared foods in our cooler and sometimes raw ingredients e.g. vegetables, meats, etc. They are easy to clean and durable. I would recommend purchasing the lid for stacking purposes. We love these 6" deep clear polycarbonate food pans for potato salad and macaroni salad on our salad bar. They are very durable and clean very easily. Got this item last week. I am happy with the weight, quality and construction of the pan. Usually I will buy cambro or rubbermaid. This item seems to be very durable also. This 1/2 size pan is a perfect size for storing food and keeping it fresh. I'm using this pan on my cut deli meat in the sandwich station and soup, fish, shrimp, oysters, crawfish, crabs, soups and meats in my cooler and they have all stayed moist and fresh. This 1/2 size pan is great. It's super durable, very reasonably priced, and hold a lot of product. I particularly like that it's very clear so we can evaluate product quality. This product is just as quality and nice as the other brands. My only complaint is that they are about 1/8" to short as they have a tendency to drop in our line coolers when you grab ingredients out of it. I bought this pan to use as a vessel to run sous vide in with my anova precision cooker. So far, it's shown to be strong, even when filled with water, it doesn't buckle at all. It's a really convenient size to fit in a sink. Good for brining a whole chicken. Really sturdy and resistant food pan. Great for a variety of uses, including storing meats to better organize fridge space. These are stackable with the more shallow models. Very good quality at a great low price. I shopped around at restaurant supply stores in my city and no one came close to the price that Webstarauntstore offers. Shipping is always quick and have never had any problems with broken or damaged items. I will always go to Webstaurantstore first when needing supplies. Great for storing food in the cooler. They stack well easy to label and great for seeing what you have. They stack well and are useful for hunfreds of jobs.